The Utah State Bar Association consists of 10,000 members, primarily judges and lawyers that practice law within the state of Utah. Dating back to the early 1900’s, their mission statement includes creating a vision where the Utah judicial system is respected, valued, understood and made accessible to the general public. The members of their association promote ethics, justice and civility, having the utmost respect for the legal system and fostering an advanced understanding of state and federal laws. Located in Salt Lake City, the Utah State Bar includes membership for both inactive and active attorneys within the state, including those that reside outside of Utah but maintain a license to practice law in Utah. 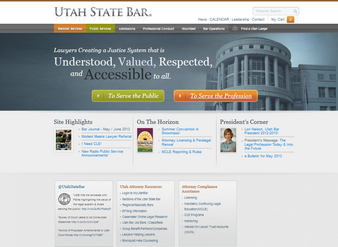 To practice law in the state, it is required that attorneys be active members of the Utah State Bar Association. Adaptivity Pro offers custom Internet marketing and design services to businesses worldwide. Residing under the talented leadership of CEO, Eric Morgan, Adaptivity Pro has thrived since their inception in 2004. Adaptivity Pro listens to their customer’s needs, creating custom personalized Internet marketing plans that are driven to help companies succeed. Their customizable plans focus on companies’ present and long-term goals, helping them steadily grow revenues, while creating a dominant web-based presence online. With custom design services, customers can rest assured that their website and Internet marketing is receiving the utmost attention and care, destine to help companies not only meet their goals, but exceed them. The professional and highly dedicated Adaptivity Pro team includes designers, programmers and writers, who specialize in creating marketing plans that are devoted to including both SEO and PPC contents, which ultimately helps companies succeed in today’s Internet-driven business module.